Back to Sewing and creative spaces this blog. I have a small sewing (creative) room but it is reasonably efficient. I read this great book and it helped alot. Have you got a great tip/hint for your creative space? The best tip I use is to have clear containers (that you can see through) and most the same size so that you can sort the little bits and pieces that we all seem to collect and eventually use. I think the Cheap shops are great for containers but make sure you get enough of the same container when you find them as sometimes they are a one off . 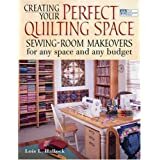 Your local quilting and sewing shop are an excellent source for your thread, spool and fabric holders and books on this subject. 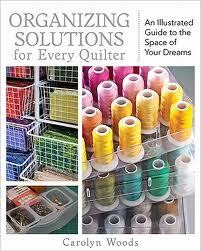 Another great book which we have in the shop is Organizing Solutions for every Quilter. It is a great idea to be organized as this saves time and money. So to spend some money on a couple of books to help you with this may just save you alot more time and money that you think. My design wall which is essential in any creative space but I have alot going on at the moment. So let me know your best hint that you have in your creative space.? Gosh Kim, you've a job ahead of you trying to pack everything up,......... glad it's you, and not me! Definitely have to have a large whiteboard handy. Practice those fills before quilting on the quilt! !